The soybean (Glycine max (L.) Merr.) is an erect leguminous plant, up to 1 m high. A fast growing herbaceous annual, it is native to Asia but currently grown worldwide. Its tap-root can extend to 2 m deep in good soil conditions, with secondary roots exploring the upper 15-20 cm of the soil. Roots bear nodules resulting from Bradyrhizobium japonicum infection (in most cases). Leaves are trifoliate and leaflets are oval to lanceolate, mostly broad in commercial cultivars (Ecoport, 2010). The papilionaceous flowers are white, pink, purple or bluish, with a 5 to 7 mm long corolla (Giller et al., 2007). Fruits are two or three-seeded pods containing yellow, rounded seeds with a hilum colour ranging from yellow to black (Koivisto, 2006). 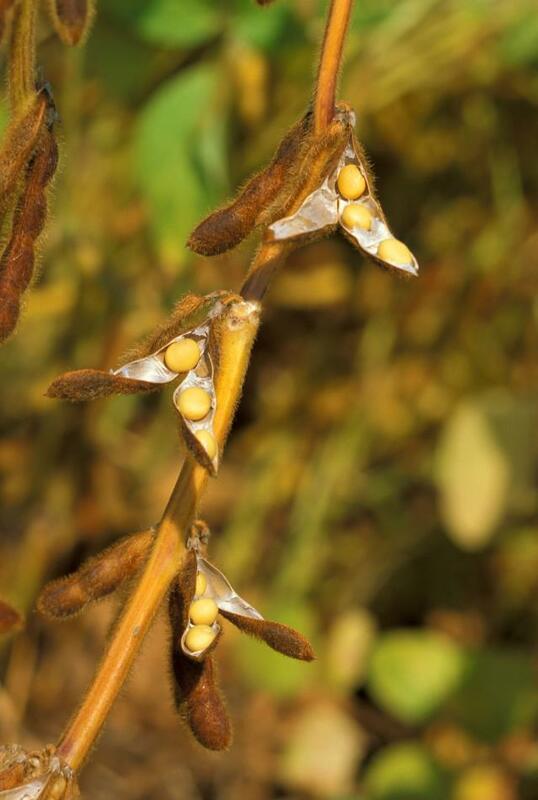 Soybean is primarily an oilseed containing about 20% oil. Soybean is the largest oilseed crop, with 231 million tons produced in 2008, the main producers being the United States, Brazil, Argentina and China (FAO, 2010). The extraction of oil results in a high-protein cake that can be further processed into a variety of products for feed and food uses. One of these products, soybean meal, is one of the major feed commodities and is the main protein source in many animal diets. Soybeans can also be used whole (full-fat soybeans). While soybean used to be grown primarily for its oil, the expansion of the crop is now driven by the demand for soybean meal and feed use accounted for about two-thirds of the value of soybeans in recent years (FAO, 2006). Soybean is used as food in tropical Africa and Asia. Western countries are a new market for soya food (exotic foods, soybean milk, tofu…). It is useful to make flour, milk, tofu and tofu-like products. It may be roasted and eaten as a snack, or fermented to make tempeh, miso, yuba and soy sauce. Immature soya beans are also eaten as a vegetable, as well as bean sprouts (Giller et al., 2007). Soybean leaves and stems can be grazed, ensiled or dried to make hay. The foliage is very palatable to cattle, has a high nutritive value and is highly digestible (Koivisto, 2006). Average world soybean yields are 2.25 t/ha while average African soybean yields are 0,5 t/ha (Giller et al., 2007). Genetically modified soybeans are now widespread in the main producing countries, and occupied 65.8 million hectares in 2008, about 68% of the world soybean area (James, 2008; FAO, 2010). In 2009, 91% of the US soybean surfaces were planted with GM soybeans, mostly herbicide-tolerant varieties (UDSA-NASS, 2009). Most of the grown GM soybeans have herbicide-resistance traits, but GM varieties have been developed for other traits, including resistance to fungi and insects, tolerance to drought and salinity, and improved nutritional and/or health characteristics: high oleic content, high protein and amino acid (especially methionine), reduced stachyose and raffinose. 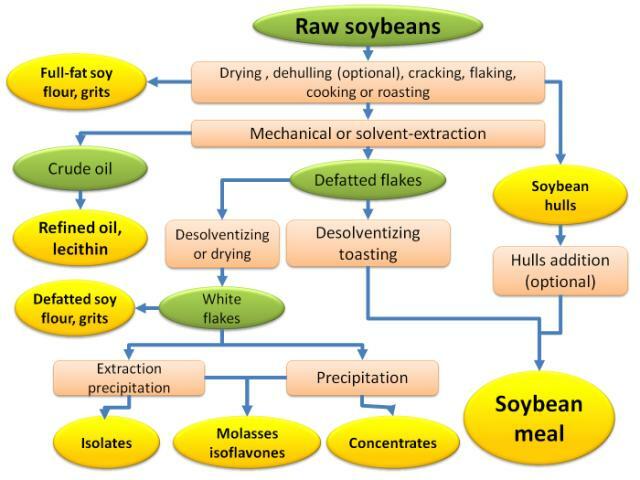 The major soybean products for feed use are soybean oil, soybean meal (the by-product of oil extraction) and whole soybeans (usually called "full-fat"), the latter being usually heat processed in order to destroy the antinutritional factors and improve their feed value. These products can be ground, pelleted, flaked or powdered. Other products include soybean flour (powdered and screened soybean meal with a very low fibre content), soybean protein concentrates and isolates (that contain more or less pure protein), soybean solubles and molasses (resulting from the washing of soybean flour and soybean flakes), soybean mill feed (by-product of the fabrication of soybean flour), and soybean mill run (by-product of the fabrication of soybean meal). 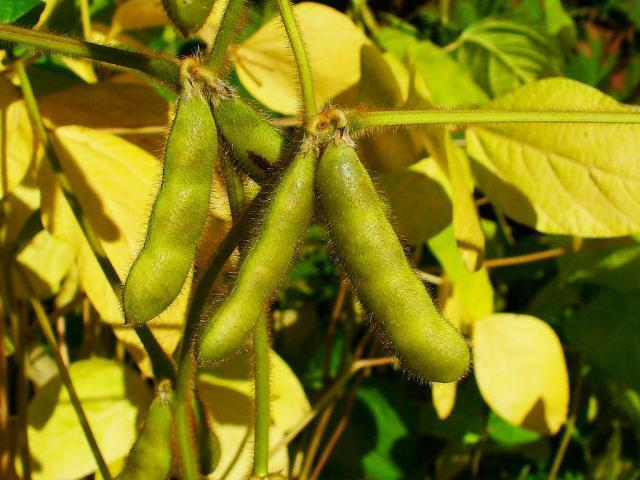 Soybean is native to Asia. It was domesticated in North China 3000 years ago, and is now produced in almost all continents between 53°N to 53°S, and from sea level up to an altitude of 2000 m. The main producing countries are the USA, Brazil, Argentina, China and India. Optimal growth conditions are average day-temperatures around 30°C, 850 mm annual rainfall, and not less than 500 mm water during the growing season, and soil pH ranging from 5.5 to 7.5 with good drainage. Soya is sensitive to soil acidity and aluminium toxicity. It can withstand short periods of waterlogging and short droughts (Ecoport, 2010). Soybean is an N-fixing legume. It can be used as green manure or as a rotation crop in combination with cotton, maize and sorghum. During the first 6-8 weeks after seedling, soya has to be weeded. After that period, its rapid growth can reduce weeds. In Africa, it is reported to reduce the parasitic weed Striga hermonthica which is very noxious to crops (Giller et al., 2007). The intensive monoculture of soybean in Brazil and Argentina has a negative effect on habitats and biodiversity. Soil erosion increases with mechanical weeding, and intensive cultivation results in a severe mining of soil fertility. Soybean cultivation is also responsible for massive deforestation in Brazil, Argentina and Paraguay (Steinfeld et al., 2006). The debate about the environmental impact of GM crops is complex and a full discussion of the issue is beyond the scope of this datasheet. The actual reduction in herbicide use due to the introduction of glyphosate-resistant soybeans is disputed. The decrease of 10% found by certain authors can be considered too modest (or linked to factors other than GM soybean), or significant enough because of the large areas cultivated with soybeans. 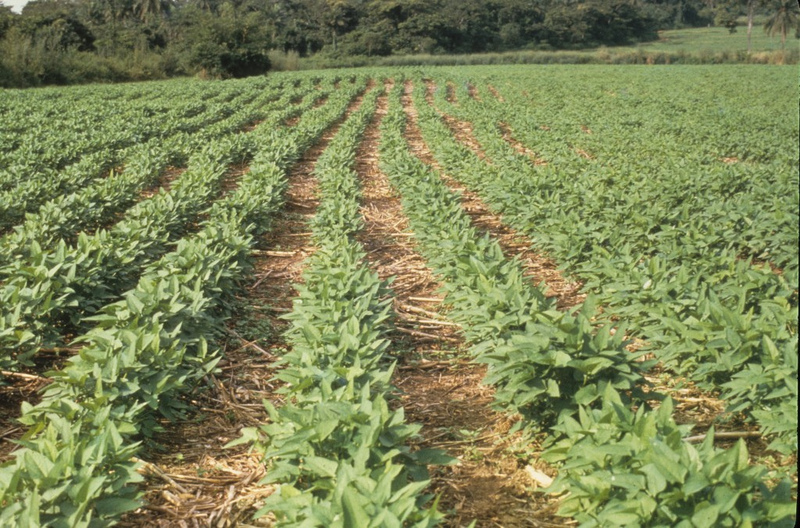 Other authors consider that herbicide-tolerant soybeans can have indirect environmental benefits by encouraging farmers to use no-tillage or conservation tillage practices that reduce soil erosion and fuel use (Edwards et al., 2009). Spontaneous, pollen-mediated gene flow has been observed but is considered too limited to be an issue. However, gene flow by seed is highly probable. Transgen introgression into wild soybeans in China and Korea, while possible, is also considered too limited to be of real concern (Owen, 2009). Soybean seeds contain several antinutritional factors. The most important ones are trypsin inhibitors, hemagglutinins, lectins and saponins. Soybean was indeed used to demonstrate the existence and the role of trypsin (Rackis et al., 1986). Trypsin inhibitors: raw soybeans contain trypsin inhibitors that bind with trypsin (a digestive enzyme) in the small intestine and form an inactive complex that prevents trypsin from degrading feed proteins (van Eys et al., 2004). Trypsin inhibitors also induce pancreatic enlargement, increased trypsin secretion and, therefore, lower N retention, growth and feed conversion (van Eys et al., 2004; Rackis et al., 1986). Leaves and stems do not contain trypsin inhibitors and there is no problem in using soybeans as roughage or silage (Koivisto, 2006). Due to these antinutritional factors, raw soybeans are unable to support growth requirements in monogastrics. Ruminants are not as sensitive because trypsin inhibitors are deactivated and degraded in the rumen (Hoffmann et al., 2003). However, trypsin inhibitors are heat labile and largely destroyed by heating (Rackis et al., 1986) so heat treatment is required before feeding soybean products to animals, particularly to monogastrics. Lectins are glycoproteins that bind with intestinal villi and reduce nutrient uptake. Lectins are also heat-labile. Saponins are glycosides that diminish uptake of other nutrients. Others anti-nutritional factors: soybean may contain antivitamins, urease and plant sterols that may interfere with the absorption of carotenoids and vitamin E (Brown et al., 2008). 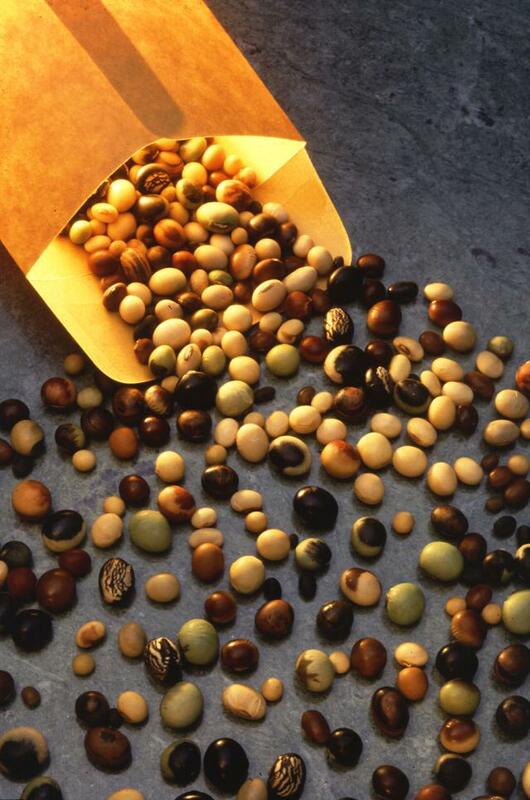 The potential health issues of genetically-modified soybeans and other GM foods is a matter of considerable debate. While most studies have failed to show deleterious side-effects to the use of GM soybean (EFSA GMO Panel, 2008), these varieties remain controversial and subject to legal authorisations in some countries.